Heat both the vegetable and olive oils in a large skillet to 350 or 360 degrees. (Use your own judgement or a thermometer!) Working quickly, and in small batches, fry the Calamari until golden brown and crispy arund the edges, about 2-3 minutes. Remove from the oil with a slotted spoon and allow to drain on the paper towel lined baking pan. While draining the Calamari, cook the Linguine according to package directions, "al dente" meaning firm to the bite. Drain, reserving at least 1 cup of the pasta cooking water. Return the pasta to the pot, add the butter and 3 tablespoons of the lemon juice. Toss to coat all of the Linguine. Add 1/4 cup of the cooking liquid and toss again. Mix in, thoroughly, 1/3 cup parsley and season to taste with salt and pepper. If the Linguine appears to be too dry, add more cooking liquid (water) and/or lemon as desired. 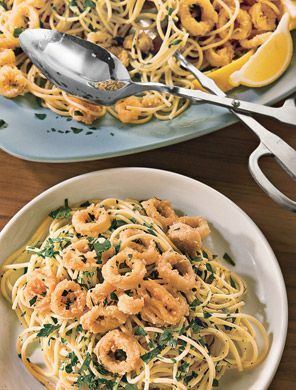 Transfer the Linguine to a large serving platter and top with the Calamari. Sprinkle with remaining parsley and serve with lemon wedges. This is another dish that my Mother would not make too often. Usually we had it at Grandma and Grandpa's house, or after their passing at my Aunt's house .. . to be exact, my Aunt Josie, the youngest girl of the family and a great Sicilian cook! Her Pasta con Sarde is without equal . . . anywhere! We would stop by the fish store on the way to her house. When we arrived with our package my Aunt knew what we wanted! Do not use grated Parmesan Cheese on this dish.